CHSG is working for you! We are often contacted by researchers, asking us to assist them in recruiting participants. Below is a list of published papers and studies in which our members have participated. Want to participate in a clinical trial or research study? 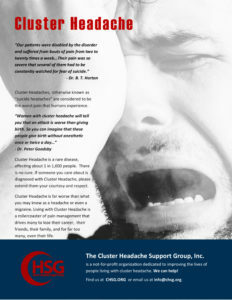 Check out all current cluster headache studies in our Clinical Trials listing.